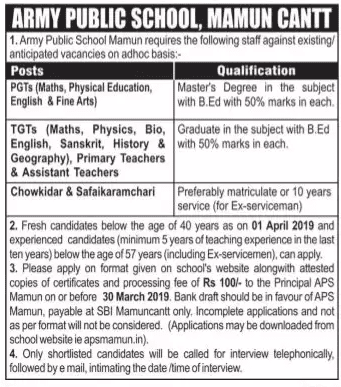 Army Public School (APS) Mamun Cantt., Pathankot has recently given notification of various TGTs, PGTs, Chowkidar, and Safaikaramchari vacancies on the ad-hoc basis. You can send your application for the APS Mamun Recruitment 2019 on or before 30.03.2019. Army Public School Mamun Recruitment 2019-20 latest notification is out. As per the Notification, there are various TGTs, PGTs, Chowkidar, and Safaikaramchari vacancies. The educational qualification is the Matriculation, Graduation and Master’s degree with B.Ed. The age limit is 40 to 57 years. 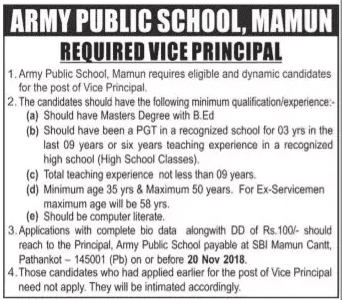 If you are looking for Jobs in Army Public School, Mamun then this article is going to be very helpful for you. 2. PGTs (Maths, Physical Education, English & Fine Arts) Masters degree in the relevant subject with B.Ed. with minimum 50% marks in each. The minimum age limit is 40 years for the fresh candidates and 57 years for the experienced candidates as on 01.04.2019. The selection is going to be on the basis of interview. Only shortlisted candidates will be called for the interview. DD of Rs. 100/-. Bank draft should be in the favor of APS Mamun, payable at SBI Mamun Cantt. Only. You can send your application with complete bio-data along with the application fee demand draft to the Principal, Army Public School Mamun Cantt. Pathankot-145001 (Pb.) on or before 30.03.2019. You can check the APS Mamun Cantt result or Interview List through the official website. Last Date: 30 March 2019. 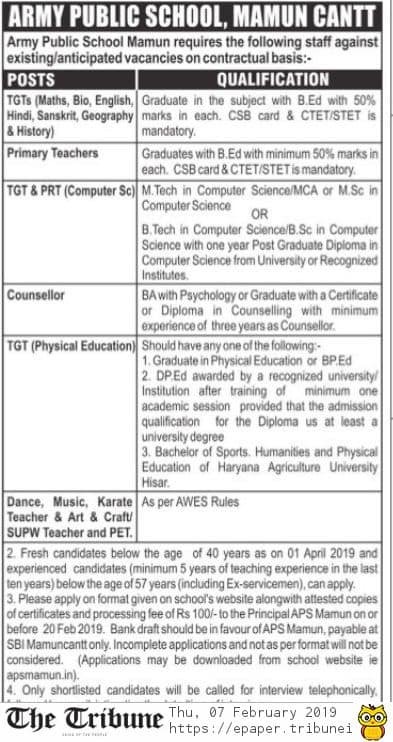 Army Public School (APS) Mamun Cantt., Pathankot has recently given notification of TGTs, PGTs, PRTs, Counselor and other vacancies on the contractual basis. You can send your application for the APS Mamun Recruitment 2019 on or before 20.02.2019. Army Public School Mamun Recruitment 2019-20 latest notification is out. As per the Notification, there are TGTs, PGTs, PRTs, Counselor and other vacancies. The educational qualification is the Graduation and Master’s degree with B.Ed. The age limit is 40 to 57 years. 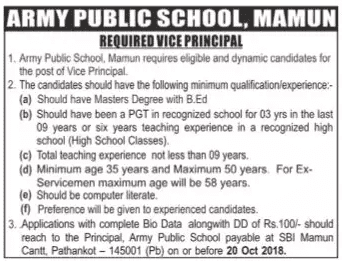 If you are looking for Teaching Jobs in Army Public School, Mamun then this article is going to be very helpful for you. 1. TGTs (Maths, Bio, English, Hindi, Sanskrit, Geography & History) Graduation in the subject with B.Ed. with at least 50% marks in each. CSB card and CTET/ STET is mandatory. 2. Primary Teachers Graduation with B.Ed. with minimum 50% marks in each. CSB Card & CTET/ STET is mandatory. 3. Counselor M. Tech in Computer Science/ MCA or M.Sc. in Computer Science. 4. TGT (Physical Education) Graduate in Physical Education or B.P.Ed. D.P.Ed. after training of minimum one each academic session. 5. Dance, Music, Karate Teacher & Art & Craft/ SUPW Teacher and PET As per the AWES rules. Name of Department: Army Public School, Mamun Cantt. You can send your application with complete bio-data along with the application fee demand draft to the Principal, Army Public School Mamun Cantt. Pathankot-145001 (Pb.) on or before 20.02.2019. Army Public School (APS) Mamun Cantt., Pathankot has recently given a notification of 01 Vice-Principal Vacancy. You can send your application for the APS Mamun Recruitment 2018 on or before 20 November 2018. Last Date: 20 November 2018. Army Public School Mamun Recruitment 2018-19 latest notification is out. As per the Notification, there is 01 Vice-Principal Vacancy. The educational qualification is the Master’s degree with B.Ed. The age limit is 35 to 50 years. If you are looking for Teaching Jobs in Army Public School, Mamun then this article is going to be very helpful for you. Educational Qualification: The candidate should have the master degree with B.Ed. The candidate should have been a PGT in recognized school for 03-years in the last 09 years or six years teaching experience in a recognized high school (High School Classes). The total experience should not be less than 09 -years. Age Limit: The minimum age limit is 35 years and the maximum is 50 years. For Ex-Serviceman the maximum age limit is 58 years. Location of Job: Mamun (Punjab). Salary: As per the department rules. Selection Process: The selection is going to be on the basis of interview. Application Fees: DD of Rs. 100/-. How to Apply: You can send your application with complete bio-data along with the application fee demand draft to the Principal, Army Public School Mamun Cantt. Pathankot-145001 (Pb.) on or before the due date. Note: The candidates who have applied for the Vice-Principal Vacancy need not apply. They will be informed accordingly. Army Public School (APS) Mamun Cantt., Pathankot has recently given a notification of 01 Vice Principal Vacancy. You can send your application for the APS Mamun Recruitment 2018 on or before 20 October 2018. Army Public School Mamun Recruitment 2018-19 latest notification is out. As per the Notification, there is 01 Vice Principal Vacancy. The educational qualification is the Master’s degree with B.Ed. The age limit is 35 to 50 years. If you are looking for Jobs in Army Public School (APS) then this article is going to be very helpful for you. Date of Interview: 20 October 2018. Educational Qualification: The candidate should have a master degree with B.Ed. The candidate should have been a PGT in recognized school for 03-years in the last 09 years or six years of teaching experience in a recognized high school (High School Classes). The total experience should not be less than 09 years. Location of Job: Mamun Cantt., (Punjab). Army Public School (APS), Mamun has given a notification of various TGTs, PGTs, ADM Supervisor, LDC, Nursing Assistant and other vacancies on the contract basis/ad-hoc basis. The interested candidates can apply for APS Mamun Recruitment 2018 on or before 10.03.2018. Army Public School Mamun Recruitment 2018-19 notification is out. As per the Notification, there are various TGTs, PGTs, ADM Supervisor, LDC, Nursing Assistant, and other vacancies. The educational qualification is Matriculation, Graduation, Post Graduation and B.Ed. If you are looking for Jobs in Mamun then this article is very helpful for you. PGT (PHE) Preferably NCC) PGT (English) Post Graduation with B.Ed. with at least 50% marks. TGTs (English, Political Science, History, Geography, Math, Physics & Chemistry Graduation Degree with B.Ed. and equivalent qualification with at least 50% marks. TGT (Computer Science) As per AWES rules & regulations. Graduation or 10 years of service as a clerk (for Ex-Serviceman – ESM). The candidates should have the typing speed of 40 words per minute and also should have accounting knowledge. Nursing Assistant (Female) & Receptionist As per CBSE/AWES rules. DD of Rs. 100/- in favor of Army Public School Mamun. Written test (for (Non-CSB)/CTET qualified candidates only) Evaluation of teaching skills and interview for the eligible candidates will be conducted. You can submit your applications for along with the demand draft of application fees on or before 10.03.2018 to the Army Public School Mamun. Last Date: 10 March 2018. Date of Interview: 15 and 16 March (Tentative).